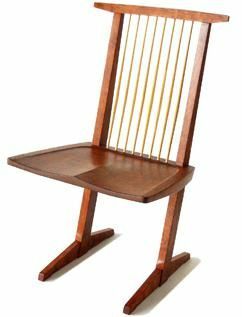 George Nakashima's iconic Conoid chair makes a design statement like very few other chairs ever produced. The perfect fusion of design and function, it blends seamlessly with so many different interiors. 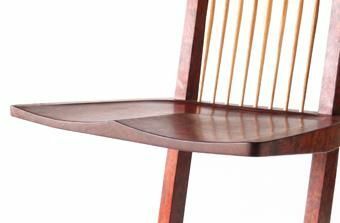 Our interpretation of the Conoid chair is true to Nakashima's design aesthetics and reputation for superb craftsmanship. Available in a variety of domestic and imported exotic hardwoods. 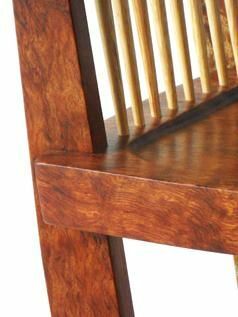 As shown in figured bubinga with hickory spindles. 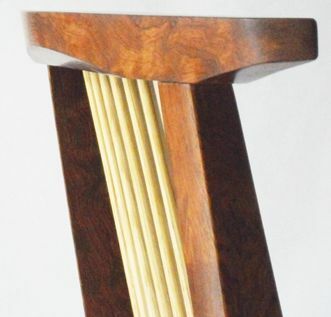 Pricing subject to wood species, quantity and special design requirements. Captain's chair with arms version available. Dimensions: 37"H x 21"W, Seat is 17-1/2" deep and 18" above floor. Custom dimensions available.